With the publication of Pope Francis’ motu proprio, Mitis Iudex Dominus Iesus, a profound reform of the process of the declaration of matrimonial nullity occurred. These developments have led to the amendment of 21 canons of Book VII of the CIC, and the entry of some "procedural rules" which now constitute genuine laws. Ever since this reform was made public, the attention of scholars and staff of Marriage Tribunals has been captivated. 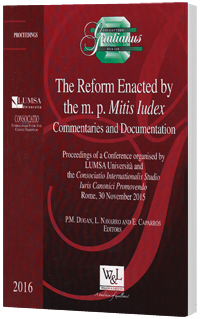 A conference, organized on October 30, 2015 by the Consociatio Internationalis Studio Iuris Canonici Promovendo together with the Scuola di Alta Formazione in Diritto Canonico, Ecclesiastico e Vaticano of the LUMSA (Libera Università Maria Santissima Assunta) of Rome, was among the first conferences in Rome to present the reform. This scientific meeting heard the interventions of Cardinal Francesco Coccopalmerio, President of the Pontifical Council for Legislative Texts; Professor Paolo Moneta, Emeritus of Canon Law and Church-State Law of the University of Pisa, both members of the Pontifical Commission that worked on the preparation of this reform, and Professor Joaquín Llobell, Professor of Procedural Law at the Pontifical University of the Holy Cross in Rome. The correct application of this reform requires, on one hand, that those who work in the Tribunals of the Church should have an in depth knowledge of the reform, and on the other hand, that those who, in the future, should be incorporated into such structures will have received adequate canonical formation. In order to better understand the meaning, content, and relevance of this legislative reform, we have seen fit to make the texts of these conferences available to the Anglophone world. Bearing in mind the moment in which they were pronounced, we have considered it suitable to publish, an Appendix, consisting of the two motu proprio, as well as the, as well as those pontifical documents which complete the reform or could help a better understanding of the wishes and intention of the Pope. As a complement to the above, we have published the answers, related to the subject, of the Pontifical Council for Legislative Texts.